"One of Canada's 50 best trips"- 'Explore' Magazine, February 2002 edition. Check out our Private Cottages! Welcome to New Brunswick, home to some of the best outdoor vacation packages available anywhere in Canada. 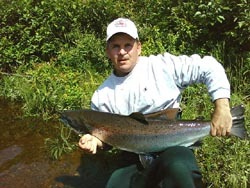 With the world class salmon fishing that the Miramichi and Restigouch rivers have become famous for, the opportunities for trout and bass fishing, the salt water fishing charters on the Bay of Fundy and Bay of Chaleur, some of the best hunting anywhere, endless miles of canoeing expeditions, whale watching tours, warm salt water beaches, and great Canada Select Outfitters and Accommodations with many packages to choose from - why not make New Brunswick your next Vacation Destination. 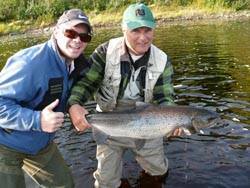 We know that most anglers who come to New Brunswick want to fish for Atlantic salmon, so being located directly on the banks of one of the most famous salmon rivers in the world, one can understand why fishing for Atlantic salmon or trout is our number one activity. However due to our excellent location in central New Brunswick, it also makes it easy to travel on fishing day trips or other day-adventures throughout the province. During your stay in New Brunswick, we can provide all that is needed for your outdoor vacation including accommodations, meals, equipment, instructions, and transportation to and from New Brunswick airports, if needed. This is a family owned and operated business, which allows us to provide some of the best prices and warm hospitality available anywhere. At the same time, we do work closely with some of the largest and best companies from around the world, to help make your vacation in New Brunswick one to remember. FISHING TRIPS AS GIFTS Fishing Adventures create memories that will outlast any fishing rod or reel, or gift, and they promote friendship and comaraderie more valuable, by far, than any material goods . 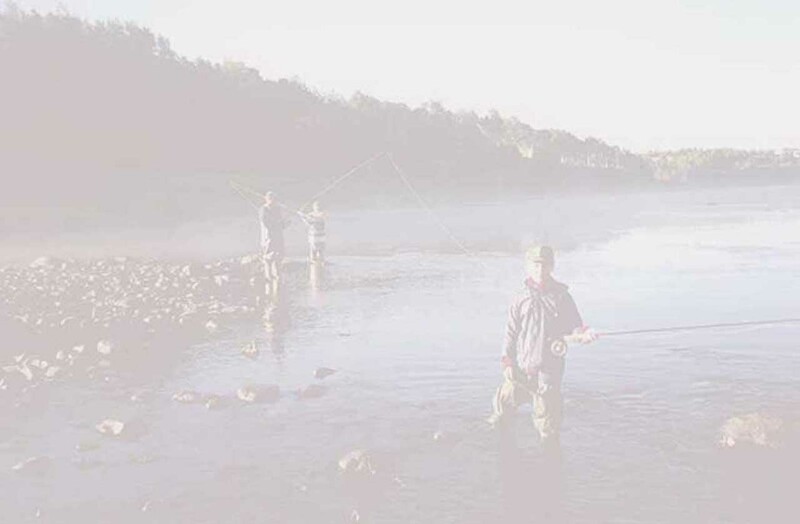 A fishing adventure is a gift of friendship that can bring loved ones closer together in the serenity and tranquility that follows a day adventure and excitement of fishing the beautiful Miramichi River. Once again we are pleased to offer our popular Gift Certificates. These all-inclusive One day, three day or week-long Certificates can be used anytime in 2019. LET US BRING YOU FROM YOUR HOME TO YOUR "HOME AWAY FROM HOME"